Born August 24, 1973 in Sudbury Ontario, left shooter Andrew Brunette started his NHL career with the Washington Capitals in 1995 playing 11 games with 3 goals and 3 assists. The 1996-97 season took Andrew to the Portland Pirates of the AHL for a brief time then returned to the Capitals to finish the season. In the 1997-98 season, Andrew again started with the Pirates playing 43 games then rejoining the Capitals once more to play 28 games and getting 11goals plus 12 assists. The 1998-99 season brought the NHL left winger to the Nashville Preditors for 77 games, 11 goals and 20 assists. The following year, Andrew joined the Atlanta Thrashers where he stayed with the team from 1999 to the 2001 season and skated 81 games with a career high of 23 goals and 27 assists for a total of 50 points. 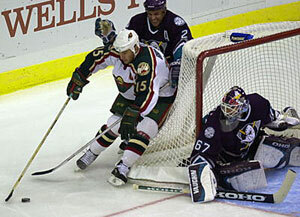 In the 2001-02 season, Andrew was off to the Minnesota Wild where he tied his career high 81 games during his 7th NHL season and the first with the Wild. Andrew has played 378 games with 4 NHL teams scoring 88 goals, 161 assists adding up to 249 points and is currently with the Minnesota Wild wearing # 15. We wish him the best for the 2002-03 season.